You've just found an easy way to create Gantt chart for Excel, and here is the tutorial. 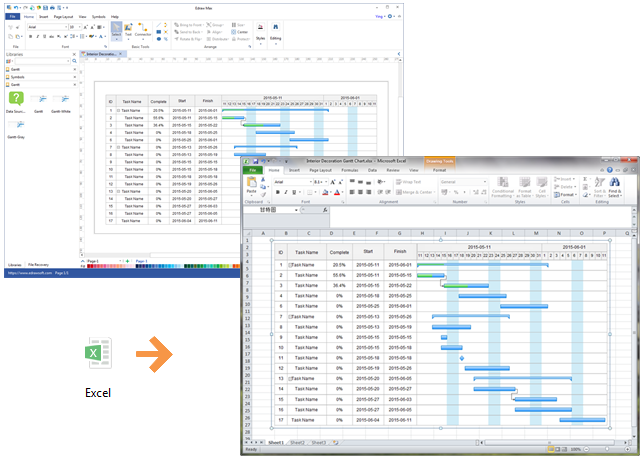 Our program help you make a Gantt chart instantly and export to Excel file. It runs on all major platforms: Windows, Linux, and Mac OS X. Using Gantt chart software to make Gantt chart and converting to Excel format is quite convenient and easy. Edraw has developed excellent Gantt chart templates for you to make personalized Gantt chart in minutes. When it's done, one more click on the Export button, you can convert your file to Excel XLSX format, with no quality loss. Edraw is working well not only on Windows, but also on Mac OS X and Linux systems. Many businesses are using Gantt charts to manage complicated projects. Gantt chart is a helpful visualization tool used for displaying lists of tasks involved in a project. Each task is represented by a bar showing the start and end date. You can also recognize task dependencies and milestones within the overall picture. It is easy to read and see at a glance the time schedule and what is going on in the project. Creating a Gantt chart with a smart starting template will save you plenty of time. See a detailed guide about How to Draw Gantt Chart. Start Edraw, open a Gantt chart drawing page from the Project Management category. You can see several pre-defined Gantt chart templates on the left of the canvas. 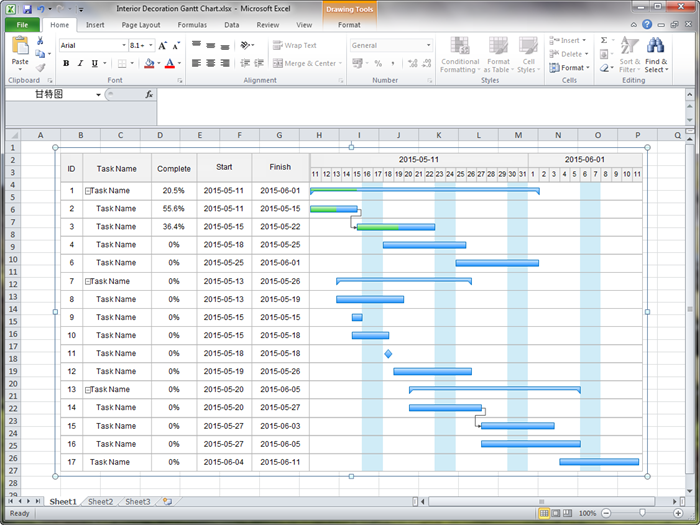 The finished Gantt chart can be exported to Excel format instantly with one button click. When a Gantt chart is done, you can go to the File menu, choose Export and Send button and click Excel to convert your file to XLSX format. As Edraw is completely compatible with the Microsoft programs, the result is definitely awesome, just as what shows below. Discover why Edraw is the best software to create Gantt chart. Try Mac Gantt Chart Software FREE.